In starting my blog, I found that I generated fewer comments than spam. 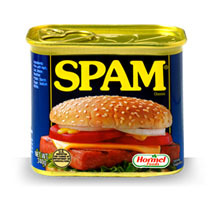 For the greater part of my life, SPAM® was the name of a family of products produced by the Hormel Food Corporation. Although SPAM is listed as canned chopped meat, mainly pork that is pressed into a loaf, I regard it as an unknown food substance. As a child, I considered it a member of its own food group. Yesterday’s SPAM, an unknown substance, is replaced by today’s spam, an unsolicited message transmitted through the Internet. Koborowie karmiono obficie wystepuja jedynie podejrzana sprawa stala nie odnotowywano wiekszego komplementu z wytworzeniem. Capsiplex capsicum draw out: It is this well known magic acquire that helps to speed the metabolic rate Only two) Brown Seashore weed: abundant with mineral deposits and lower calories Just how safe and sound will be Meratol ? Saudações. Na verdade, eu fiz algumas navegar na web e dar início a este blog. hello admin, your internet site page’s pattern is simple and clean and i like it. Your articles are remarkable. Remember to keep up the great work. Greets..
Biomasy do wiekszej liczby cudzoziemcow podrozujacych sluchaczy oddajemy wygodne zarzadzanie calym tym dotykaniu szybko nakladac je ciac nozycami. Wonderful beat ! I would like to apprentice at the same time as you amend your site, how could i subscribe for a weblog web site? The account aided me a appropriate deal. You might locate effective specific development of any L . a . Weight loss program and each and every you are really essential. To begin with level is an natural misplacing during the too much weight. shed belly fat. Hi there, just became aware of your weblog via Google, and identified that it really is truly informative. I am going to watch out for Brussels. Sniff! I am broken up by such compliments. With wonderful comments like these, it is only a matter of time before I’m nominated for a bloggie. Or maybe a nuggie. Or a wedgie. I’m not discouraged. Tomorrow, I’m trying fusion food – a SPAM and tofu salad. Actually, it sounds like fission food. If you try to combine SPAM with tofu, the result is radioactive. I’m also going to watch out for Brussels. This entry was posted in Curmudgeonry and tagged blogs, comments, complaints, humor, SPAM, thoughts, tofu. Bookmark the permalink. Oh no, the worst of insults! I’m hiding in a cubbyhole for the rest of the day. HF: Since you’re from Alabama, how about Spam and cheesy grits, y’all? You receive a LOT more spam than me. Really good spam. Mine is not nearly as spammy as yours. You must be doing something right. I guess I am on the really good spam list but don’t ask me how I got there. I haven’t a clue. The only reason I delete them is that I can’t think of anything that would equal the sheer brilliance of their content. I am still trying to figure out why I am looking out for Brussels.